For the city in Canada, see London, Ontario. London is the capital and largest city of England and the United Kingdom. The River Thames travels through the city. London is the biggest city in western Europe, and the world's largest financial centre. London is about 2000 years old. London was founded by the Romans. It was called Londinium by the Romans. London was also called Lunnainn in Scottish Gaelic, Llundain in Welsh and Londain in Irish. The population of London is 8.63 million. Most people in London are British. However, London also has many immigrants. These people come from many different countries. They speak many different languages and have different religions and cultures. There are also many people from different countries who stay in London on business. Many people visit London as tourists. They may see the famous "Sights of London". These sights include palaces, churches and museums. The Romans built the city of Londinium along the River Thames in the year AD 43 The name Londinium (and later 'London') came from the Celtic language of the Ancient Britons. In the year AD 61, the city was attacked and destroyed. Then the Romans rebuilt the city, and London became an important trading hub. After the decline of the Roman Empire, few people remained in London. This was partly because of the Anglo-Saxon people of Sub-Roman Britain being primarily agricultural. 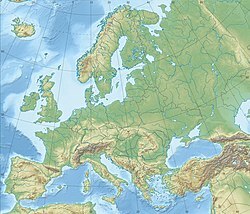 Once the Romans had gone, trade with Continental Europe dwindled. In the 9th century, more people started living in London again. 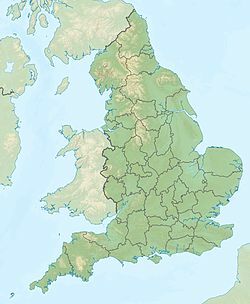 It became the largest city in England. 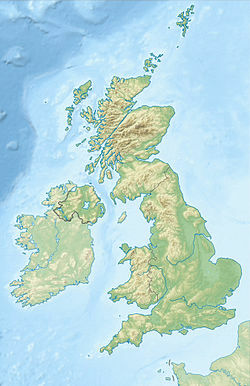 However, it did not become the capital city of England until the 12th century. Another famous old part of Greater London is Westminster, which was always a different city from the City of London. In Westminster is Westminster Abbey (a cathedral), The Palace of Westminster (the Houses of Parliament, with Big Ben), and 10 Downing Street (where the Prime Minister lives). 885 - King Alfred the Great recaptures the city and makes peace with the Viking leader Guthrum. 1045-50 - Westminster Abbey is rebuilt by Edward the Confessor who is buried there in January 1066. 1066 - William the Conqueror is crowned in Westminster Abbey. 1100 - The population is about 16,000. 1300 - The population of London has risen to 100,000. 1908 - The Summer Olympic Games take place in London. 1940-1941 - London was bombed by Germany during World War II. This is known as The Blitz. 1948 - The Summer Olympic Games take place in London for the second time. 1966 - The Football World Cup final took place in London. It was won by England. 2005 - The 7 July bombings on the London Underground and a bus. 52 people die and over 700 people are injured. 2012 - The Summer Olympic Games take place in London for a third time. 2017 - There were two terrorist attacks that happened in London this year. The first happened in March on Westminster Bridge and Parliament Square. Five people are killed outside the Palace of Westminster including the attacker and a police officer. 40 more people were injured. Another attack happened on London Bridge in June. Seven people were killed before the Metropolitan Police shot down the three attackers near Borough Market. The Islamic State has said they were responsible for both attacks. London has an oceanic, or temperate climate. It is not usually very hot or cold. It is often cloudy. London has many celebrations, festivals and events. 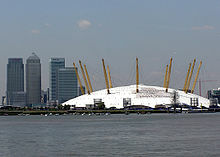 The Millennium Dome, seen from the River Thames. London has five major business districts: the City, Westminster, Canary Wharf, Camden & Islington and Lambeth & Southwark. The London Stock Exchange is the most international stock exchange and the largest in Europe. London's largest industry is finance. This includes banks, stock exchanges, investment companies and insurance companies The Bank of England is located in London and is the second oldest bank in the world. The British Broadcasting Company (BBC) which has many radio and TV stations is in London. Tourism is one of London's biggest industries. London is the most visited city in the world by international tourists with 18.8 million international visitors per year. 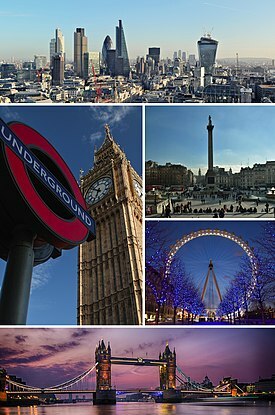 Within the UK, London is home to the ten most-visited tourist attractions. Tourism employed about 350,000 full-time workers in London in 2003. Tourists spend about £15 billion per year. A growing number of technology companies are based in London. For the 19th and much of the 20th centuries London was a major manufacturing centre (see Manufacturing in London), with over 1.5 million industrial workers in 1960. Many products were made in London including ships, electronics and cars. Nowadays, most of these manufacturing companies are closed but some drug companies still make medicine in London. London also has a "partnership" agreement with Tokyo, Japan. The city has a huge network of transport systems including trains, metros (underground) and five main airports. The Victorians built many train systems in the mid-19th century (1850s). Their main stations are in London, and the lines go to every part of Great Britain. There were originally five major companies but the five companies became a national rail network in modern times. There are five airports, though only one is actually in London (London City Airport). There is the London end of the London–Birmingham canal, which was important to the industrial 19th century. The most used airport is Heathrow International Airport although it is actually outside the city. The metro or London Underground is a system of electric trains which are in London, United Kingdom. It is the oldest underground railway in the world. It started running in 1863 as the Metropolitan Railway. After the opening the system was copied in many other cities, for example New York and Madrid. Even though it is called the Underground about half of it is above the ground. The "Tube" is a slang name for the London Underground, because the tunnels for some of the lines are round tubes running through the ground. The Underground has got 274 stations and over 408 km of track. From 2006–2007 over 1 billion passengers used the underground. ↑ "Metropolitan Area Populations". Eurostat. 16 November 2017. Retrieved 17 November 2017. ↑ "Population Estimates for UK, England and Wales, Scotland and Northern Ireland". ONS. 22 June 2017. Retrieved 26 June 2017. ↑ "Regional gross value added (income approach) - Office for National Statistics". www.ons.gov.uk. ↑ "XE: Convert GBP/USD. United Kingdom Pound to United States Dollar". www.xe.com. ↑ "Global Financial Centres 9" (PDF). Z/Yen. 2011. ↑ ""World's most economically powerful cities"". Forbes. 15 July 2008. Archived from the original on 19 May 2011. Retrieved 3 October 2010. ↑ "Worldwide Centres of Commerce Index 2008" (PDF). Mastercard. ↑ "London in Scottish Gaelic". Glosbe Dictionary website. Retrieved 15 April 2014. ↑ "Population Growth in London, 1939–2015" (PDF). London Datastore. Greater London Authority. January 2015. p. 2. Retrieved 16 September 2015. ↑ "BBC NEWS - INDEPTH - LONDON ATTACKS". news.bbc.co.uk. ↑ "London Heathrow Airport". Met Office. Retrieved 11 December 2018. ↑ "Heathrow Airport Extreme Values". KNMI. Retrieved 11 December 2018. ↑ "Heathrow 1981–2010 mean maximum and minimum values". KNMI. Retrieved 11 December 2018. ↑ "Top 10 Annual Events in London". Smithsonian. Retrieved 2018-02-04. ↑ 17.0 17.1 17.2 17.3 "Beijing, London to be sister cities". China Daily, 11 April 2006. Retrieved 6 June 2006. ↑ "Sister City - London". nyc.gov. Retrieved 3 February 2007. Wikimedia Commons has media related to London. This page was last changed on 15 April 2019, at 14:37.